Army Builder is a windows program that helps you build an army for use in playing Warhammer Fantasy Battle that conforms to the rules of the game. This simple program took all the pain out of building my little Dwarf army and got me playing much faster - I highly recommend it. As there is only a Windows version of the program, I have to run it in a virtual machine (VM), but that has turned out to be a good decision anyway as we'll see later. I only noticed today that the new Army Builder (3.2) has a mobile option which outputs an HTML page of your army list which can be easily read on mobile devices. You can click on the various topic headers to view the info that would normally be on the printed sheet at that point dynamically. Very cool - now only if I actually had a mobile device or cell phone that could display it! 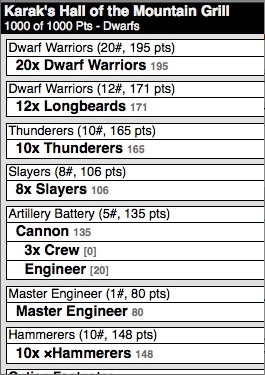 My current (Dwarf) army is only 1000 points, but I've been gathering some more figures lately in the hopes of getting it up to 2000 someday. You can see the current lineup (from a Christmas game with Ned) at right. 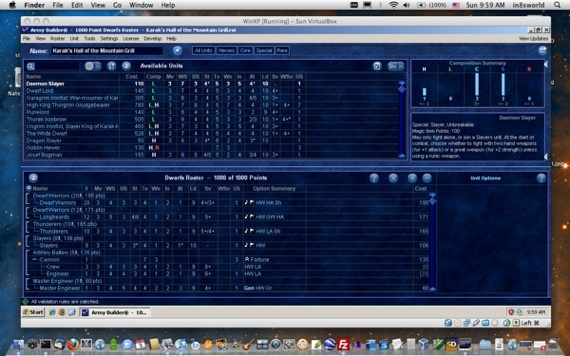 Army builder is a windows program. The folks that wrote the program are a very small company and there's no hope for a Mac or Linux version (the two operating systems I use), so I decided to install it on a virtual machine instead. You can run out and buy software to run a virtual machine, but Sun makes one that you can use for FREE! Sun's Virtualbox is easy to install (on any OS), easy to set up, and seems faster than some of the other VMs I've used. You do have to own a copy of Windows outright if you want to run a VM of Windows of course. The nicest thing about this choice for me was that if I decide to just run Linux on my next laptop (and not buy another Mac) I can easily install Virtualbox and load up my Windows VM with Army Builder already installed and as far as Army Builder cares it's still on the same machine (although I don't pretend to know the dirty details, Army Builder's license seems to be tied to the machine it's installed on through a hash of some kind made with information from the machine itself and the OS on it). Since the VM file (these can get large, mine's currently 4.2GB) is the machine and the OS in one, Army Builder is none the wiser if I decide to run it on my Linux box instead.